They went to the next room and opened the door. It was exactly the same as the first one. There was the large round table with the large pot of stew which made the Holy man’s mouth water. The people were equipped with the same long-handled spoons, but here the people were well nourished and plump, laughing and talking. The Holy man said, “I don’t understand.” “It is simple” said the Lord, “it requires but one skill. 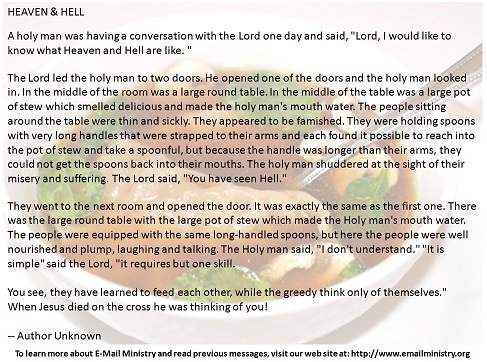 You see, they have learned to feed each other, while the greedy think only of themselves.” When Jesus died on the cross he was thinking of you!